This Quick Sandwich Recipe is one that has withstood the test of time. For years, it has come to the aid of people who need a quick snack to appease a sudden hunger pang. It is a popular snack with kids and office-goers, and is sold commonly in canteens and bakeries. It is a wonderful snack to accompany tea, because it is both filling and tasty. 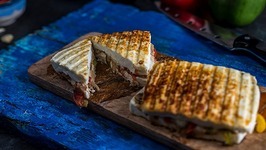 Here, a succulent stuffing of onions and tomatoes perked up with spice powders is sandwiched along with cheese between two buttered bread slices, and cooked on a tava with more butter, till the bread is perfectly crisp and appetizingly golden in colour! The crispness of the bread and the juiciness of the filling contrast beautifully making this an ever-popular snack. 1. Divide the stuffing into 4 equal portions. 2. Place 2 bread slices on a clean, dry surface and spread 1/2 tsp of butter evenly over each slice. 3. Place a portion of the stuffing on one buttered bread slice and spread it evenly. 4. Sandwich it using another bread slice with the buttered side facing downwards and press it lightly. 5. Brush 1/2 tsp of butter evenly over it. 6. Heat a non-stick a tava (griddle), put 1/2 tsp of butter for cooking and place the sandwich on it with the buttered side facing upwards and cook on a medium flame till it turns golden brown in color from both the sides. 7. Cut the sandwich diagonally into 2 equal portions. 8. Repeat steps 2 to 7 to make 3 more sandwiches. 9. Serve immediately with tomato ketchup.